This article continues on from Part 5 - Video Revisited. Now the video controller was sorted out and FPGABee was functional enough to run a game that I wrote back in the 80's, but there was no sound. In this article FPGABee gets a speaker. The Microbee's sound interface is extremely simple - bit 6 on I/O port 2 is wired to the speaker, so toggling that bit will also toggle the speaker. Toggle it at a suitable frequency and you get sound. In a real Microbee, port 2 is actually connected to the PIO - a Programmable I/O chip that also handled tape I/O and other I/O responsibilities. For the purposes of the speaker, FPGABee doesn't need the PIO so I'll be ignoring that for now. Since I don't have 10V handy, I picked up the 3.3V from the Nexys' PMod connector and adjusted R27 down to 15K. 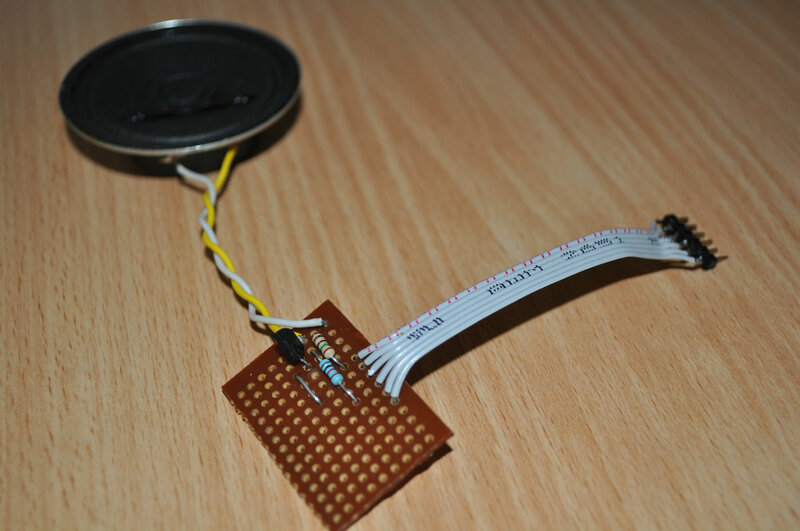 Although the speaker is currently connected to it's own PMod port, I decided to use PMod pin 3 since this would allow putting both the speaker and keyboard (which uses pins 2 and 4) on the one PMod connector later if necessary. Pretty simple and it worked first go. I heard the familiar Microworld Basic boot beep and running Robot Fire made the appropriate noises. It's a little quieter than a real Microbee, but that's a good thing. Building FPGABee Version 1 continues with Part 7 - Peripheral Control Unit.